Wonderful photograph of Odin, Ted thinks he knows the location but what does everyone else think? The background looks very much like the wooded slopes just north of Oxenholme station. Signs of the diverging Windermere line in the foreground. You could well be right, John. Referring to the maps mentioned in Mystery 218, if this is Oxenholme then the camera position would be similar to that one, but rather nearer the Main Lines and pointing further to the left. In this shot No.3 SB would then be out of shot to the right. Can anyone suggest whether or not it may be the same photographer and/or date? The two lines in the foreground would be the Down and Up Branch, at a slight angle to the Down and Up Main (Up Main only just visible). 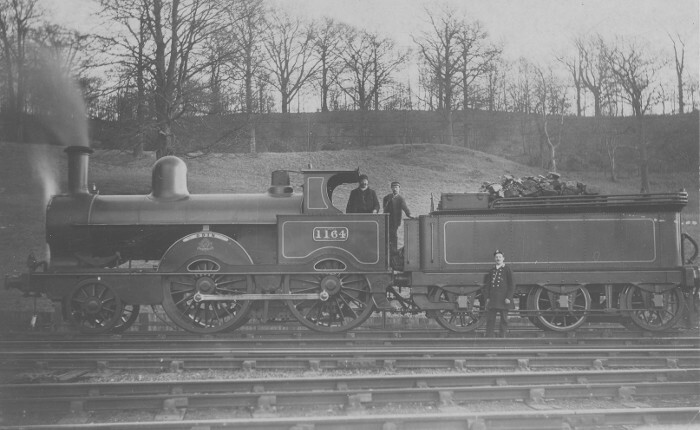 The engine would be standing in the siding nearest the Up Main, with the second siding also just visible behind. That all seems to fit. I assume that the engine would have been detached from a Down train, and then crossed over into the siding. Was it usual for trains to change engines at Oxenholme? Where would it have to go to turn before returning south with a different train? Or, does anyone have a different interpretation? Yes, I'm sure that this photo was taken at Oxenholme from just a few feet north of Photo No 218. The date was probably 1896-1902 (enlarged on the screen, the central front lamp-socket doesn't appear to be there) but from the look of the background trees - leafless here, but fully leaved in 218 - it must have been taken on a different occasion.